A quarter of a century (I know) after the release of their debut album, 'First', the original line-up of eighties New Wave pop outfit Then Jerico are getting together for an autumn 2012 tour. Lead singer and songwriter Mark Shaw formed Then Jerico in 1983 but it wasn't until 1987 when 'First (The Sound of Music)', to give it its full title, was released to much excitement. That year saw singles 'Muscle Deep' and 'The Motive' conquer the airwaves across Europe. The follow-up record, 'The Big Area', and its title single, performed even better. 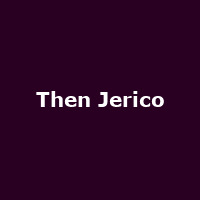 The track was Then Jerico's biggest UK hit, reaching No 13 on the singles chart and, again, was packed with radio-friendly hooks that made it a hit far beyond the UK. It was also used on the soundtrack to the 1989 sci-fi movie 'Slipstream', starring sometime Luke Skywalker, Mark Hamill. Shaw began pursuing a solo career just a year or so later and found some success before relaunching Then Jerico in earnest in 1998. This year sees a digital re-release of their 'First' album and the classic line-up of Jasper Stainthorpe, Scott Taylor, Rob Downes and Steve Wren joining Shaw once again. Then Jerico will perform their entire 1989 album 'The Big Area' along with a selection of hits from 'First' at a series of O2 Academy shows this autumn. The Big Area Tour kicks off in Newcastle on Thursday 20th September followed by dates in Glasgow, Liverpool, Sheffield, Birmingham and Bristol, before the final gig at the O2 Academy in Islington on Saturday 29th September. Tickets go on general sale Friday, but we will have pre-sale tickets ahead of this on Wednesday 7th March at 9AM, priced £22.50 for London and £18.50 for all other locations.